There are various electrical, mechanical and chemical methods used to achieve haemostasis in spine surgery. Chemical haemostatic agents are often preferable to bipolar cautery in intraspinal procedures, because these products control bleeding without occluding the vessel lumen and cause no thermal injuries to adjacent structures. A topical haemostat is the often the technique of choice to control bleeding from bone and to diffuse capillary and epidural venous oozing. This paper focuses on technical aspects of the application of absorbable porcine gelatine and regenerated, oxidised cellulose. 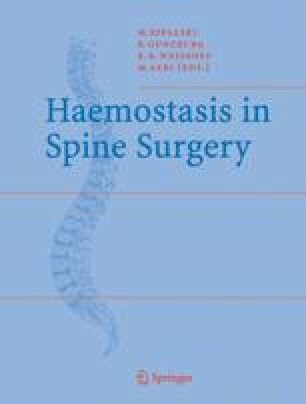 These haemostats have been used in neurosurgical intraspinal procedures for more than 30 years; however, new application forms like Surgicel fibrillar and Surgifoam powder imply different handling options, which are discussed in this paper.